Q: How can you get people to believe that 2 + 2 = 5, that the color of black is the same as the color of white, and that the Republicans' hate of gays caused the Orlando massacre? A: That's easy. You borrow a page from Joseph Goebbels, the NAZI's Reich Ministry of Public Enlightenment and Propaganda - you omit the facts and just keep repeating the lie over and over until it becomes the truth. Two weeks ago, Omar Mateen slaughtered 49 Americans at a gay nightclub in Orlando, pledging allegiance to the Islamic State during the massacre. Months before, he told a friend he was planning to vote for Hillary Clinton in the upcoming election. 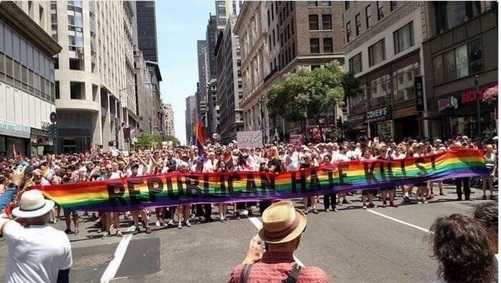 But during the New York City Pride parade this last weekend, a large banner was carried through the streets that read, "Republican hate kills," as the crowd chanted, "NRA, sashay away:"